They’re waiting. Waiting in plain sight, hung from the chimney with care, assembled of felt and yarn and sparkles. Everyone in the house for the holidays is an adult now, but still we hang our stockings. The practice of hanging a Christmas stocking… why hang a sock to collect treats, or put out a shoe as people do it in some cultures? 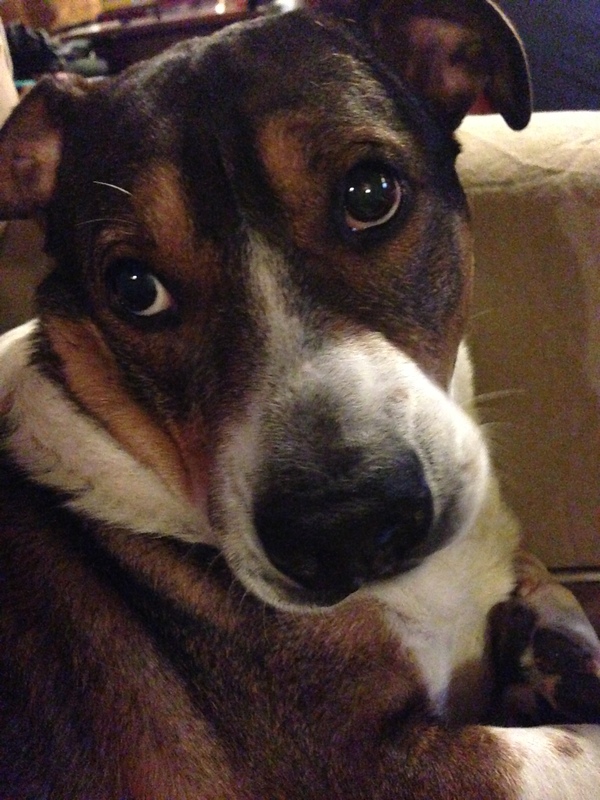 I’ve never found a satisfactory answer, but I always associate it with the idea that your dog always wants to chew up your shoe, because he loves you and that’s the part of you that smells most like you. He knows not what he does. That’s what I’ve always heard. 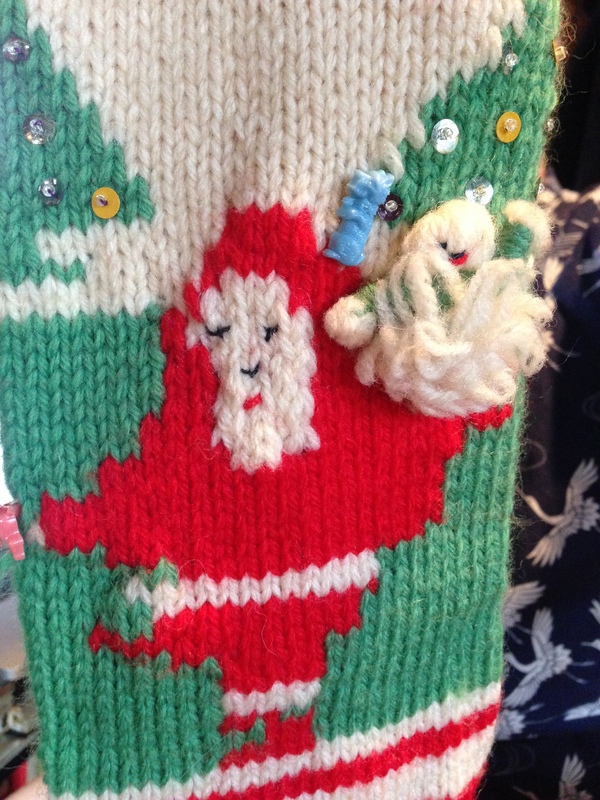 So Santa is looking to find the part of you that is most you when he tracks down the stocking you hang with care. 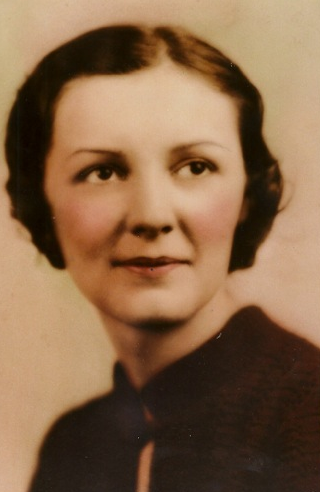 Auntie, my mother’s aunt, made her converted sweet potato shed in Greenfield, Tennessee into a cozy home. She had a tiny room that never failed to impress me with its huge stash of craft materials, from buttons to calico to giant skeins of acrylic yarn. Auntie knitted, she made lace, she crocheted, she sewed. She was simply a craft adept. And she loved kids, though she never had any of her own, referring to her home economics students at Dresden High School as my children. 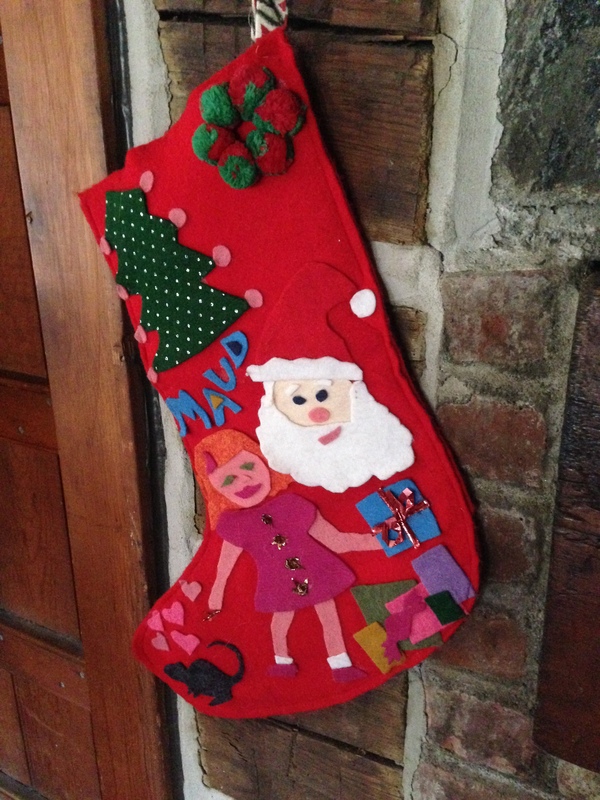 My Christmas stocking and those of my brothers were Auntie’s creations. Last year I learned to knit a sock. I thought I could use it as a Christmas stocking if it ever got long enough. It didn’t. It was orange anyway. Luckily I still have my old beauty from Auntie. 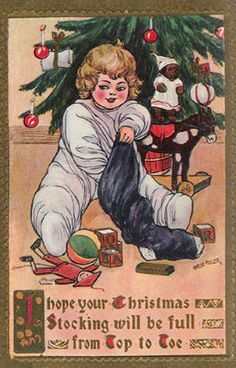 For some reason people have competed over the years to set a record for the biggest Christmas stocking. That seems odd to me, as a Christmas stocking is by nature pleasantly ordinary of stature, somewhat roomier than an actual sock that fits your foot but no larger as that would be somehow… greedy. One time recently The Children’s Society in London organized a stocking of 6,000 squares of red knitting, as long as three doubledecker buses. I hear that it weighed the equivalent of five reindeer and bulged with with toys for the poor. 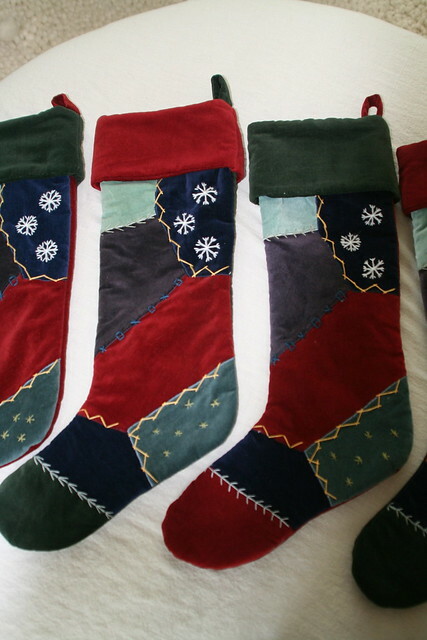 If you have a stocking that is yours and has always been yours, you are lucky. 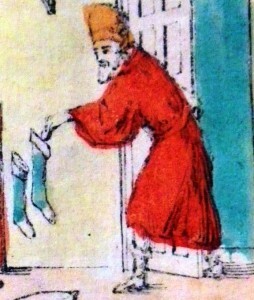 A personal stocking. Gil’s stocking reverted back to him somewhere along the way, emerging out of the Wisconsin Christmas Box, perhaps when someone noticed he was on the verge of entering a second childhood and needed all the treats he could get. 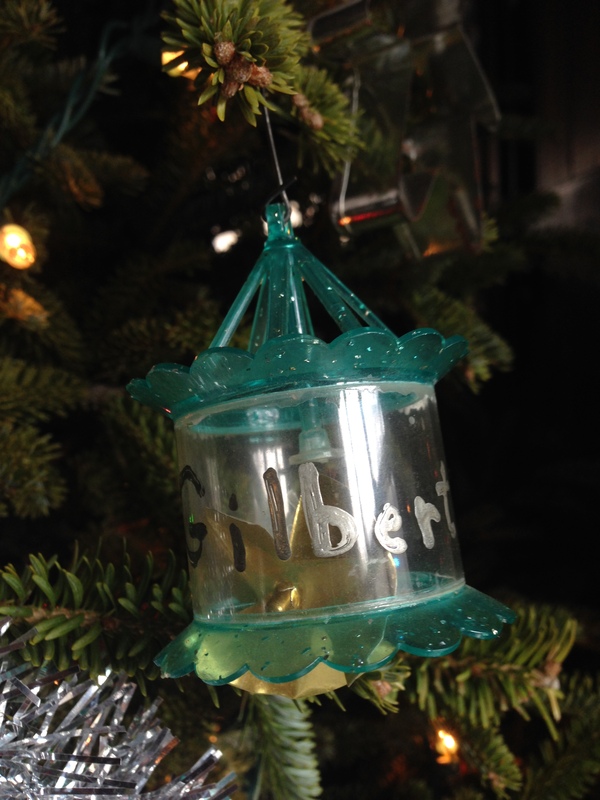 He also inherited the Christmas ornaments his mother made for him, one for every year of his young life. Most of them seem to be assembled of toothpicks in some form or another. 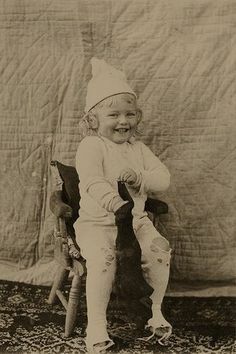 Gil was the youngest of five, and that made it important that the old lady brought in to produce his stocking should knit the letters of his name in a bold block print around the top edge. He wanted his fair share of candy on Christmas morning. 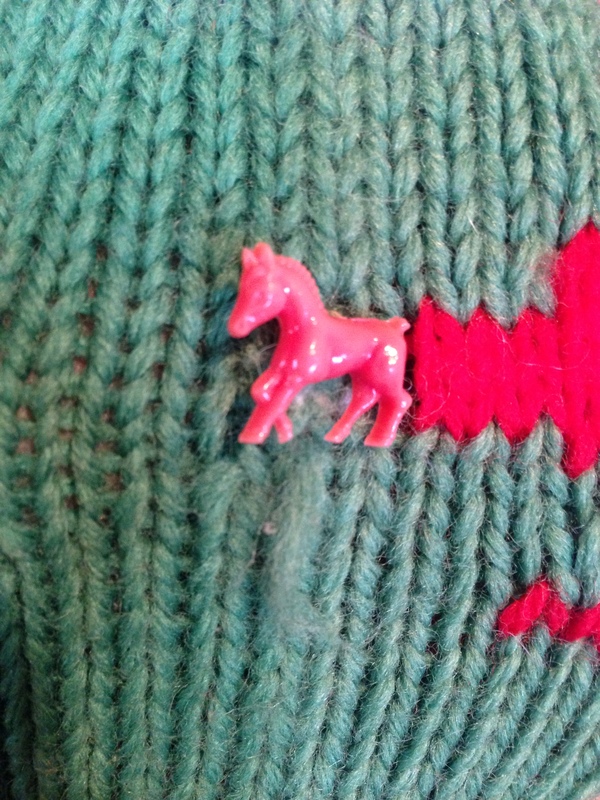 Gil remembers the fascination he felt for the tiny plastic gewgaws that decorated his stocking. 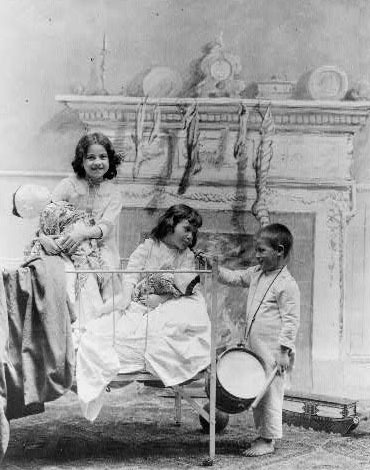 The little drummer boy with his big sisters in this 1890 shot could actually be Gil. Maud must have been around three when I decided to make her a personalized stocking. I remember carefully picking out the supplies at a crafts store near her grandparents’ house, where we were staying for the holidays. 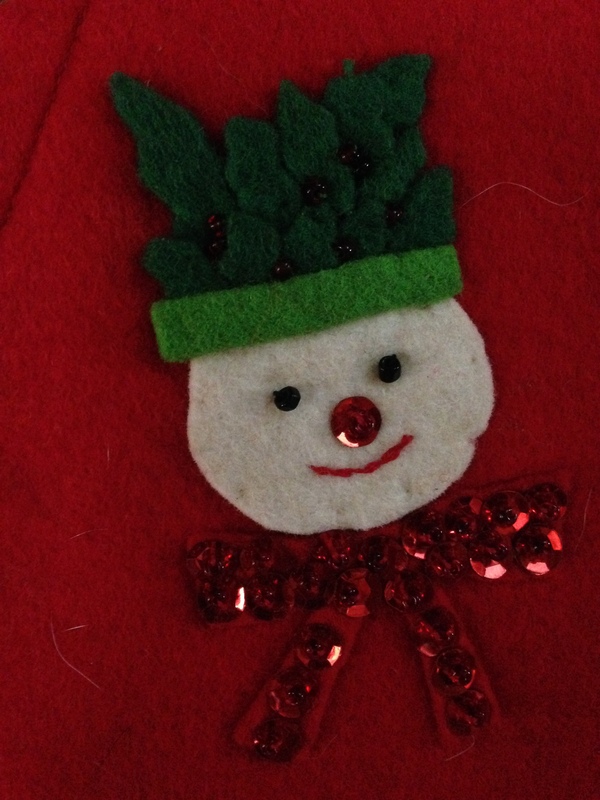 With enough glue, red, white and green felt and some pompoms would surely make something. And it did. For some reason a curious mouse found its way onto the toe – maybe I was thinking of the Nutcracker. The stocking had hearts and bow-tied presents and glitter, plus the letters of her name, all the trimmings my little sprite would want to see hanging near the fireplace. The girl herself looked all grown up. It was as if I was looking into the future. The stocking, I knew, would be a keeper. And filled by Maud this year. I knitted stockings for all my kids, and one each for their father and I. Fortunate family to have you at its center creating so much beauty…. 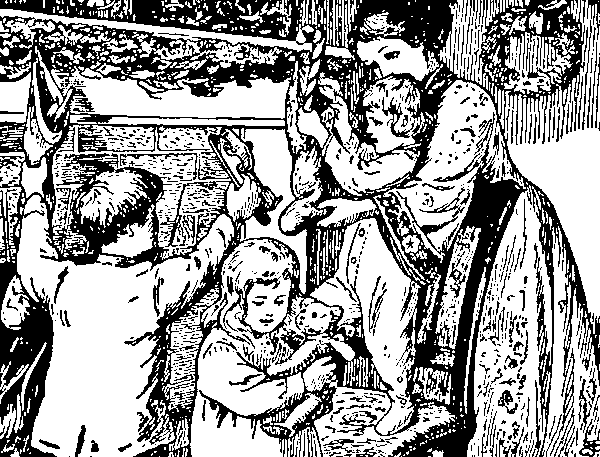 Lucky is the family in which EACH member hangs the same, hand-made stocking every Christmas Eve, for his or her whole life, or most of it. 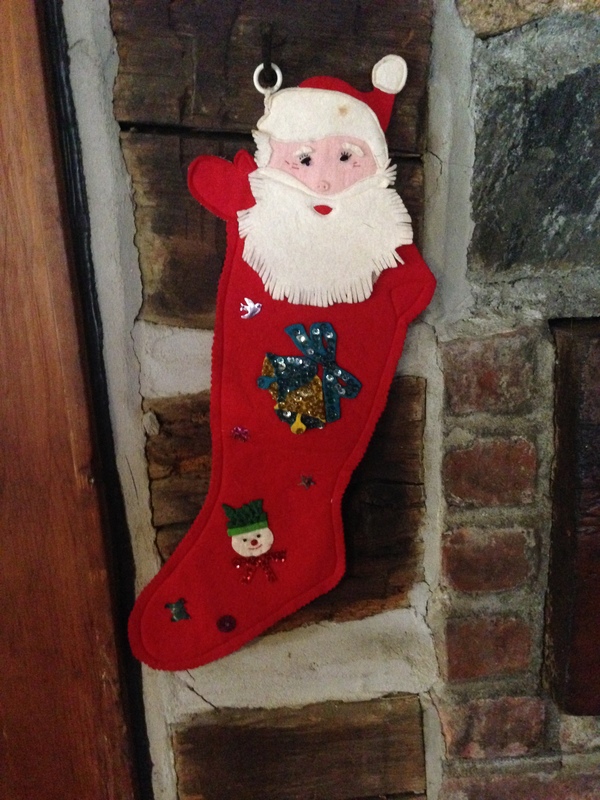 Forty-five years ago, my mother employed a friend to knit a wonderful Christmas stocking for my two-year-old son, and he still hangs it, every year. Not everyone is so lucky; the commercially-available Christmas Stockings flood the markets every year, handsome, decorative ones, mass-produced, in every imaginable size and material, but not the same. I was just wondering where those Xmas stockings were!